Thankfully the wily squirrel who crossed a high-voltage power line at LAX didn’t disrupt important airport transmissions, just the air conditioning systems. Sigh, squirrels and power lines: A never-ending struggle. Squirrel Causes Mild Mayhem in Charleston, S.C.
First it was Fort Worth. Now it’s Charleston, S.C. This time, the squirrel got the traffic lights to go awry. Thankfully, though, the water supply is safe — unlike poor Forth Worth’s. “A squirrel was responsible for unplugging the South Carolina Electric & Gas Co. clients for about a half-hour, as well as playing havoc with traffic lights. ..The doomed animal sneaked into a substation near where St. Andrews Boulevard becomes Old Towne Road. During its ill-fated journey at about 7:30 a.m., it made contact with two high-voltage points. Squirrels causing power outages is old news. But a squirrel causing a power outage, a boil water notice and the forced closure of hundreds of businesses? Now that’s worthy of a mention in Squirrels, Squirrels, Squirrels. There’s been a huge increase lately in the amount of news stories about power outages caused by squirrels. The squirrels seem to do one of three things: 1) chew on a power line, 2) accidentally step on a hot power line, or 3) cram themselves into a transformer box. In all cases, they end up dead, and cause widespread power losses. First, a few weeks ago, there was the highly publicized “flaming squirrel” in Bayonne, NJ, that chewed through wires, electrocuted itself and then fell on a woman’s car — setting it on fire. 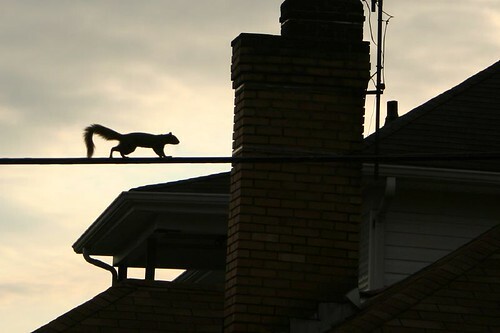 A squirrel walking on a power line is blamed for power outages in downtown Toronto that caused several traffic accidents. Then, for the third time this year, a squirrel chewing through a power line causes a power outage at the University of Kentucky. (They are now buying squirrel guards, thank goodness). Then, in Bloomington, Ill., a squirrel worked itself into a power substation, leaving about 1,500 homes and businesses temporarily without power. And finally (for now! ), students had to go without power for some classes during an outage blamed on a squirrel at the University of Kansas. As the article explains, Doug Wulff, owner of Critter Guard in Columbia Missouri, said squirrels are the third leading cause of power outages. “Squirrels are a huge menace,” Wulff said. Thankfully, Wulff sells products to combat the menace — the Critter Guard.